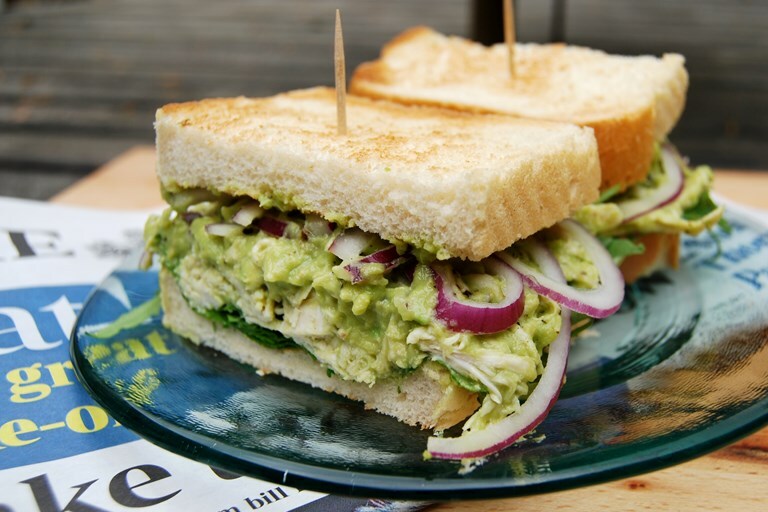 The ideal way to use up leftover roast chicken, this sandwich recipe from Rachel Phipps includes an avocado mayonnaise and tangy red onions. For a weekend treat, serve with a nice cold beer. I must admit to not being much of a sandwich person. Yes, I eat sandwiches at home when I have fresh bread and I can’t think of anything better to have for lunch; they’re usually unimaginative cold cut or leftover meat, tomato, cucumber and lettuce jobs. when I’m grabbing something to eat on the go I always head to the sushi section, and I can only remember ordering something between bread, that was not a burger, in a restaurant once. But that first restaurant sandwich, that sandwich made me realise how exciting sandwiches could be, and made me want to start challenging myself to be more creative in my own kitchen. I was grabbing lunch during a lunch meeting at The Sycamore Kitchen on La Brea Avenue in Los Angeles, and I ordered a Roasted Chicken Breast, Green Olive Tapenade, Meyer Lemon Confit, Tomato, Frisse and Mayonnaise Sandwich on Country Bread. Simple and delicious, store cupboard ingredients, perfectly balanced and just packed with flavour. I’ve been working on recreating it for myself ever since, but I still don’t quite have the sliced lemon confit down. 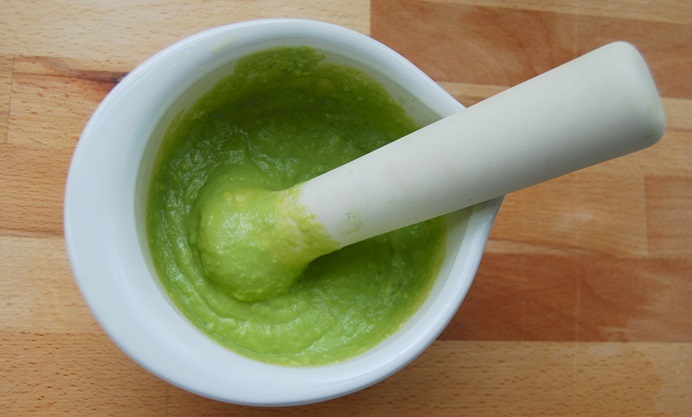 Avocados are so often used as a fat replacement in baking because they contain so much oil, so it is no surprise that you can make homemade mayonnaise with a mortar and pestle substituting the gradually added mayo for avocado that has been mashed until smooth and still get it to a pretty great consistency. You can flavour it as you would any mayo or guacamole, with plenty of sea salt and freshly squeezed lemon juice. I prefer not to do this in this particular sandwich, but this mayo is also great with a bit of crushed garlic mixed in, too. 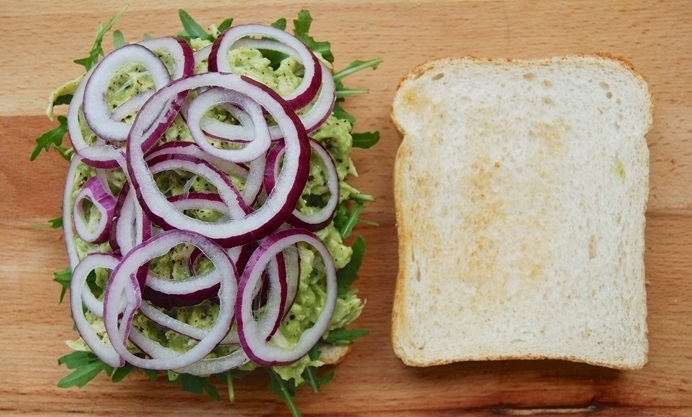 While you need the rings of red onion and the peppery rocket to cut through the creaminess of the avocado mayonnaise, that much red onion in a lunch time sandwich might not make you the most popular person later in the afternoon. I combat this by soaking the slices in a bowl of cold water for five minutes before patting them dry and adding them to my sandwich. This takes away some of the onion tang while still retaining the great flavour.